Is your beloved greyhound at risk? There is a growing body of evidence that short-haired dogs or those with pale skin are subject to sunburn and skin cancers. Greyhounds fall into this category – many have areas of minimal or no hair and sensitive pale skin. Why take a chance? We have a solution. We all know the thinning ozone layer is allowing more of the harmful UVA and UVB light rays through our atmosphere. The incidence of skin cancer in humans is increasing. But do dogs have the same problems? Unfortunately, the answer is yes. We usually only hear about the three different types of skin cancer that are linked to sunlight exposure: basal cell, squamous cell, and malignant melanoma. The good news is that most cancers in canines are squamous cell carcinomas that, when treated early, have a good survival rate. The bad news, however, is that there is also evidence that light-colored dogs or those with thin haircoats have a higher risk of developing another cancer known as hemangiomasarcomas. Worse news is that Whippets and Italian Greyhounds are among those which have a higher than expected incidence of these cancers induced by sun exposure. Sources have differing percentages but it appears that 20-40% of skin growths in dogs are cancerous. Note that malignant melanoma in dogs is extremely aggressive but is more frequently found in the mouth, eyes and toes. Whether there is a connection to sun exposure is unclear – these melanomas may be inherited mutations. But as we said above, why take any chances? The solution is sun-protection. Pet sun screen is only a partial solution. Therefore, we have designed a “Sun Coat” made from the same UVA / UBA protective fabric used to protect humans from the dangerous rays. 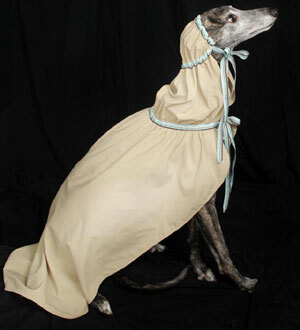 Why a Gilding the Greyhound suncoat? · The fabric will prevent the harmful rays from reaching your pet’s skin. · It’s loose enough to be comfortable on a hot day. · The unique closure keeps it in place through romping or outdoor napping. · It is stylish, comes in beautiful colors and classy trims. Click here to see our research on this subject. “UVA” is the term for the long wavelength ultraviolet rays from the sun – sometimes called the “aging” rays. UVA rays have greater potential to cause damage in the early morning and late afternoon. “UVB” is the term for the medium wavelength ultraviolet rays from the sun – sometimes called the “burning” rays. UVB rays have greater potential to cause damage during the late morning and early afternoon. “Sun protection cloth” is any fabric that provides adequate protection from the dangerous rays of the sun. Generally a UPF value of 15 to 50 and above blocks 93 – 98 % of UV radiation. “UPF” is the Ultraviolet Protection Factor. It is a measure the amount of ultraviolet radiation that a fabric blocks. Our sun protective fabrics are at least 30 UPF; most are rated 40-50 UPF.